As others were dashing south for a last dose of European sunshine, I found myself travelling to Warsaw to work. The schedule does not include much free time, but I stole a couple of hours on Sunday afternoon to inspect what I hoped would be Warsaw’s finest cup of tea. I was not disappointed. Not only does the Hotel Bristol offer a good range of teas, it also offers a proper afternoon tea complete with scones and clotted cream. I had just had lunch, so could not test the scones, but I did see lots of people with three-tiered cake stands and they did not look miserable. The price for afternoon tea is very attractive indeed, at PLN49 (Nov 2014 price) a proper bargain. 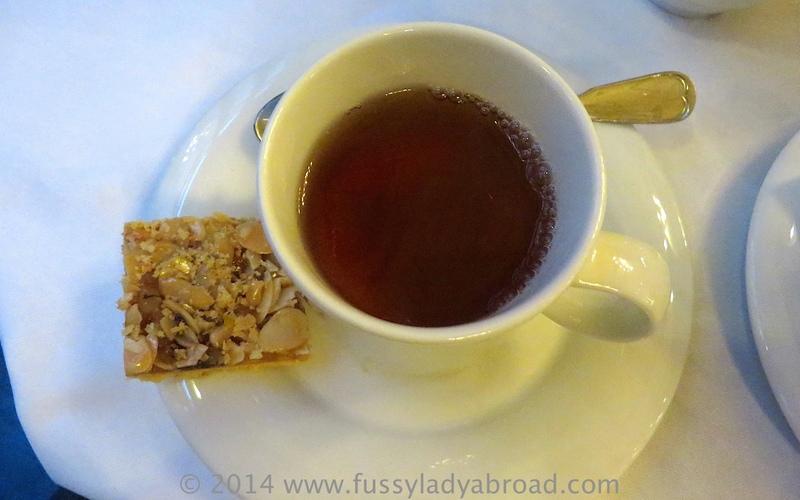 I ordered my favourite Darjeeling and it arrived, with the ubiquitous florentine biscuit. If I am honest, I’d really prefer a ginger snap or a little piece of shortbread with my cup of tea. My friend WifieWhoLunches would be happy though. She hates it when tea is served “naked” as she simply cannot drink tea without something sweet. I’m not so fussy on that account. 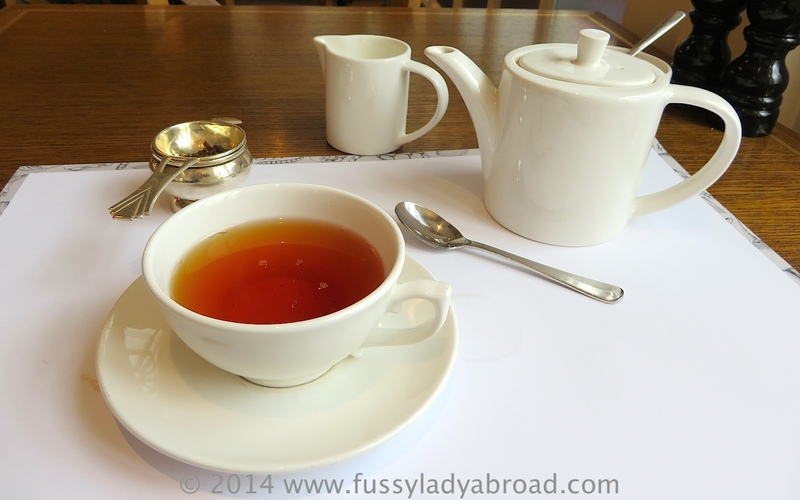 Now back to the Darjeeling: I don’t know whether it was the cold weather, or the fact that I had enjoyed LOT’s idea of service for my previous beverage, or whether this really was one of the best cups of tea I had had in a long time. 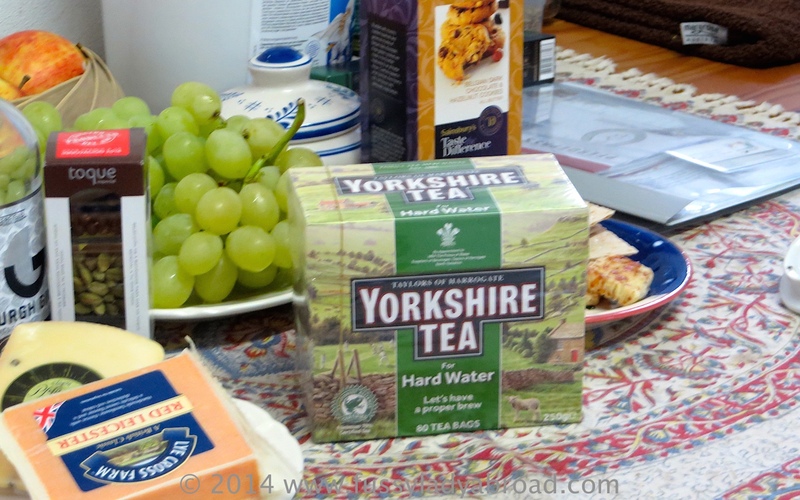 It was hot and wet and fragrant and delicate and altogether an utterly fabulous cup of tea. The service at the Hotel Bristol was impeccable. Every member of staff I saw said “good day” or acknowledged me somehow. The person who served my tea was polite and spoke English well. When I mentioned that I had enjoyed the tea so much, the waiter told me that they have two different qualities of tea, one that is served with the afternoon tea and the “normal” one. 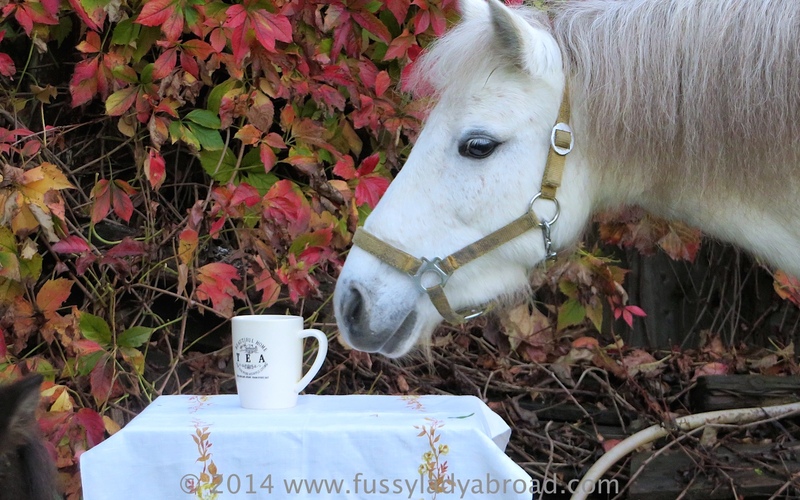 Although I had not ordered afternoon tea, he had served me the superior quality afternoon tea Darjeeling. 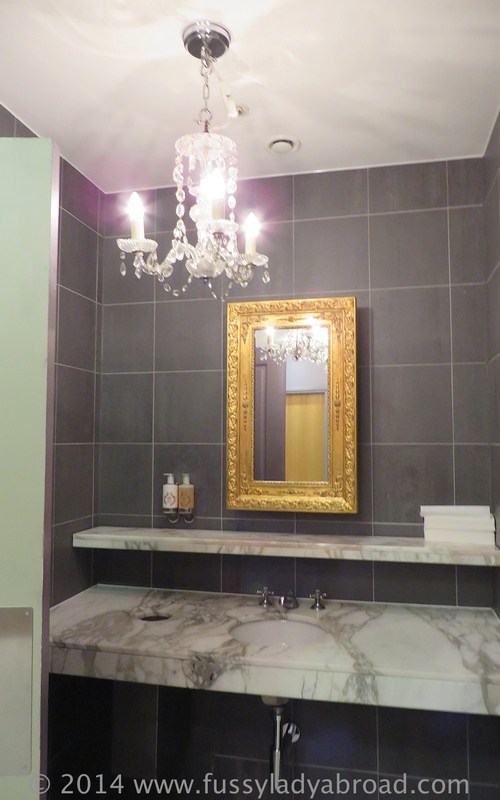 The Hotel Bristol is beautifully maintained, restored, furnished and decorated. 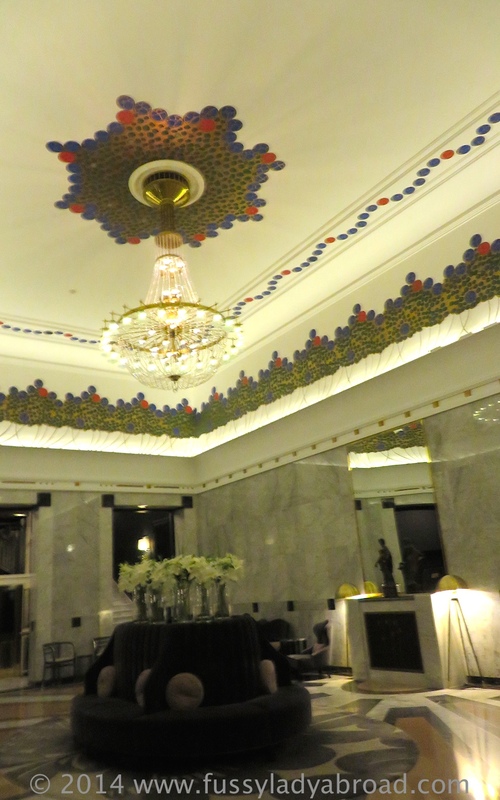 The Column bar, where I took my tea is an art nouveau jewel designed by Otto Wagner. Guide books will send you to the Cafe Bristol, which is very nice and cosy, but for my money the Column bar is the place to go. The seating nooks are comfortable and offer great privacy due to the high-backed curved benches. 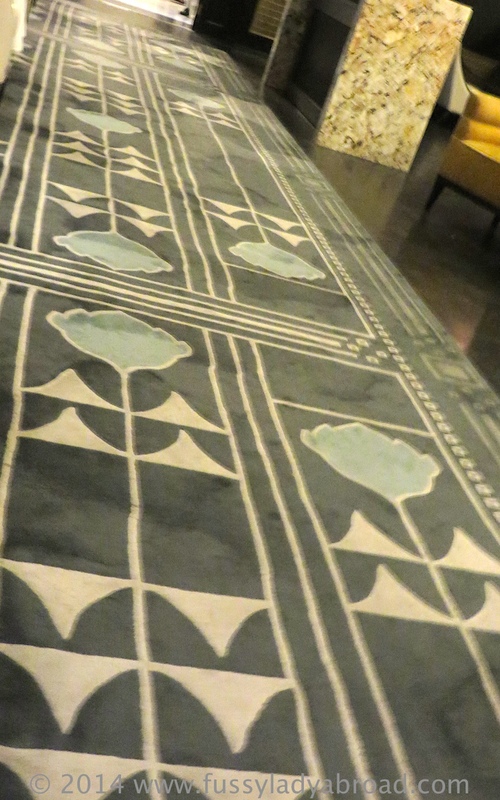 The carpet looks like it was made for the room. Everything is spotless and floral and other decorations are tasteful and appropriate. 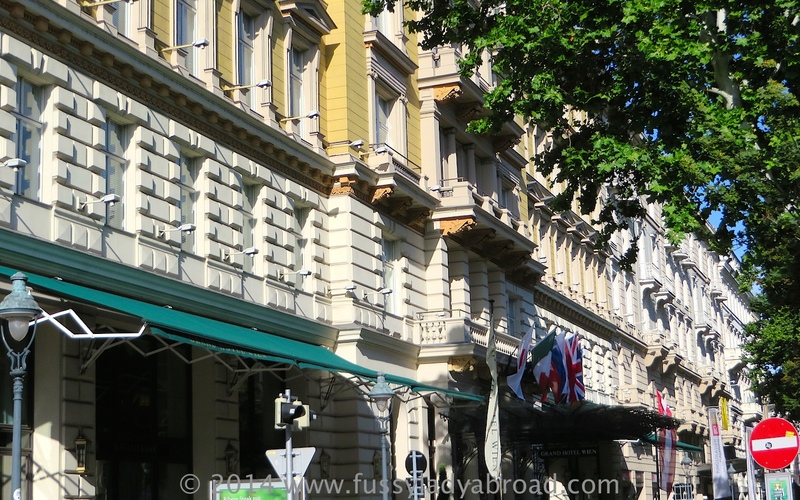 When I arrived, the room was busy with tourists, well dressed wealthy locals and t-shirt clad hotel residents enjoying drinks or afternoon tea. As I was leaving I stopped to take some photos of this lobby and, behind the lilies, I found a distant colleague checking his mail. Turns out that he, and a few more of our conference participants, were staying at this hotel. Of course, they all said that they had incredible deals, preferential company rates, rooms without windows in the attic etc. My colleague was at least open about his love of grand hotels and did not apologise for staying there. 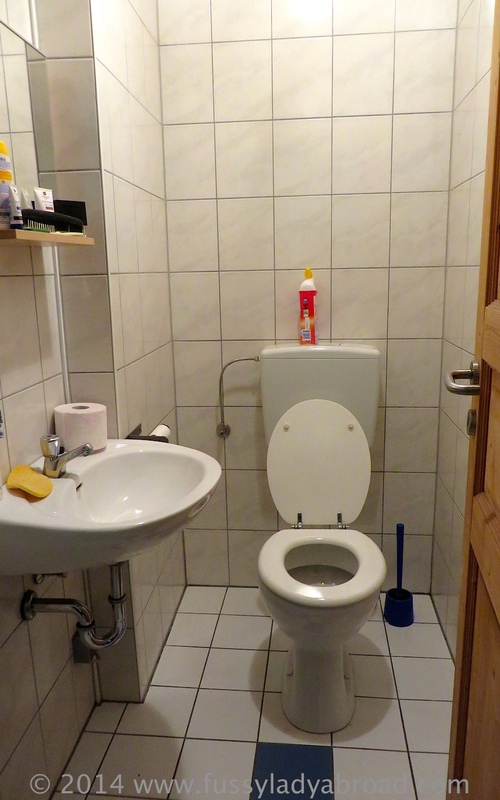 After the beautiful Otto Wagner rooms, I was hoping for some nice detailing in the ladies room, but I was disappointed. 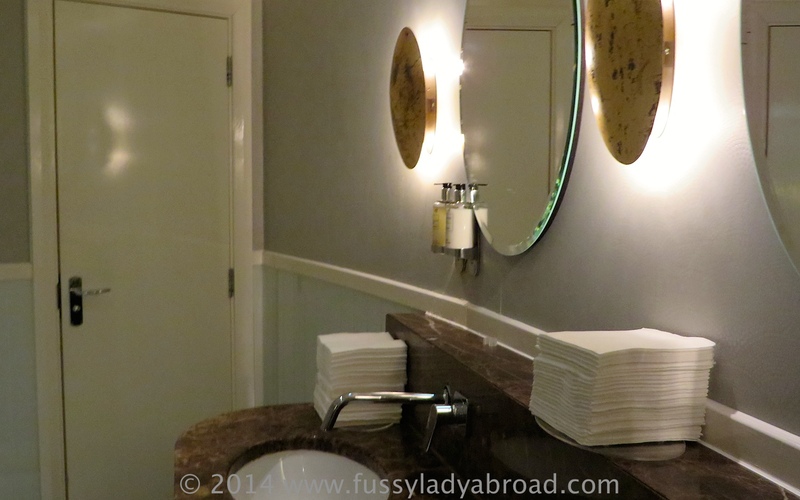 Just the standard marble and mirror offering and paper towels, so nothing to talk about. Now, I think many establishments miss an opportunity to underline their brand values (or whatever the marketing types say) in the ladies’ room. 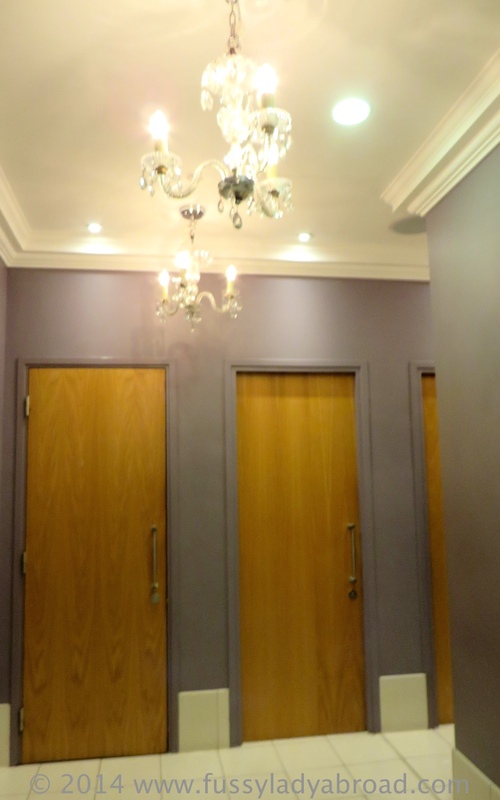 Just remember, the ladies’ room is as much a shop window as, well, the shop window. I was so thrilled by my cup of tea experience, that I persuaded some colleagues to join me there for quick aperitif a few days later. MadFrenchLady had only 20 minutes to spare, but that was long enough for her to gulp down a Pernod, or Ricard, or similar aniseed flavoured poison that the French consider a de rigeur preparation for the dinner to follow. The rest of us enjoyed our drinks and the evening ambience. There was music in the background and the lighting was changed for evening. We all regretted that we would not have time to take a full afternoon tea there. If you have not been to Warsaw recently, go. Go now. This is a city that is changing fast. The old town is beautiful, the new parts are exciting. 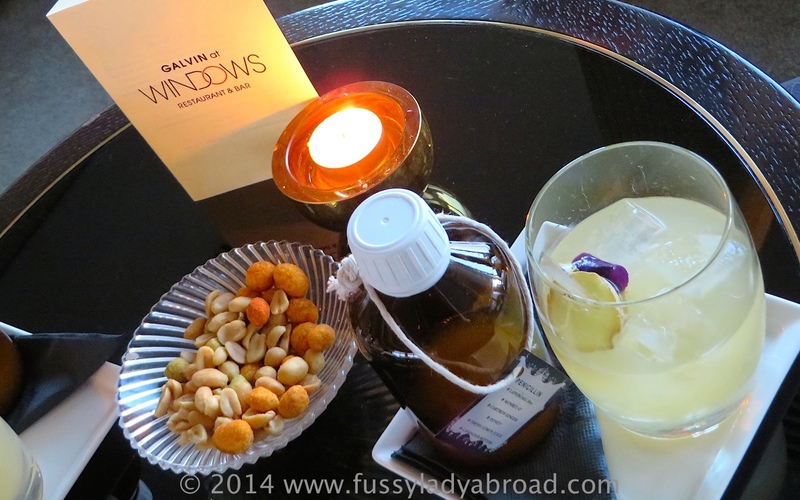 Just for fun, I popped to the panorama bar on the 40th floor of the Marriot hotel. The view of Warsaw by night was great, but I think it would be best either in the daytime or at sunset. 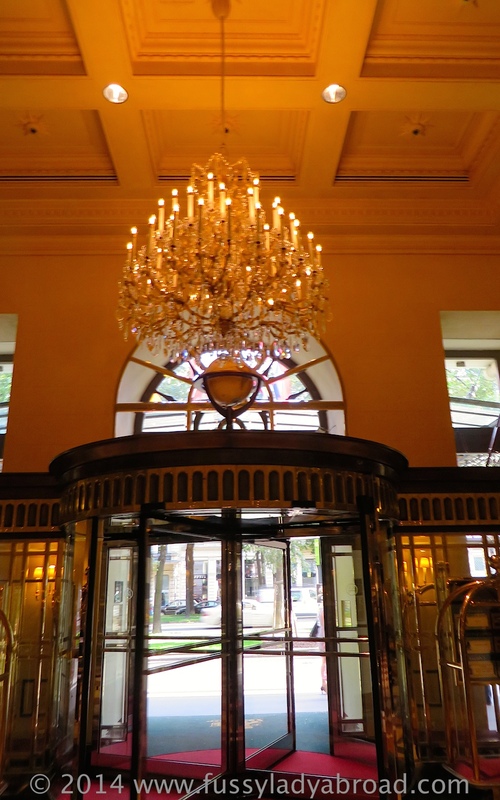 I stayed at the Sofitel Victoria. We ate at the Brasserie a few times and each time the food was wonderful, even MadFrenchLady said so. The Victoria also boasts an award-winning cocktail bartender, but I think he was off duty when I was ordering drinks, as the cocktails I had were decidedly average. For a proper cup of tea, or a drink, or an afternoon tea I can recommend the Hotel Bristol, Warsaw with 4 little teapots out of a possible 5. 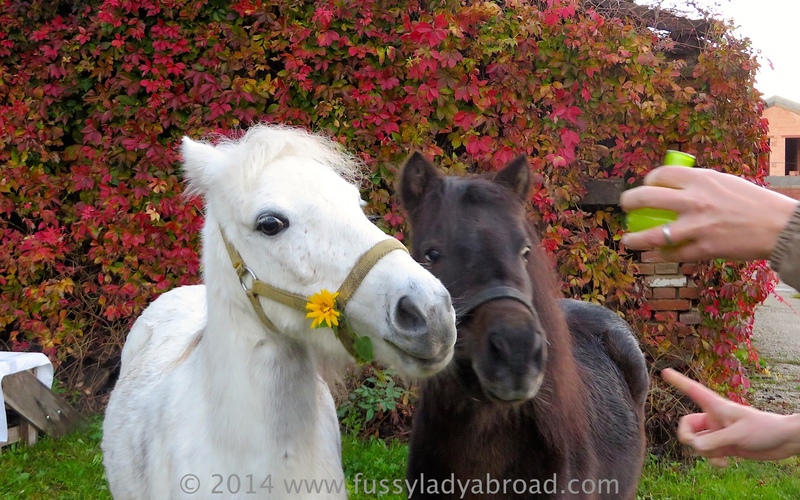 The charming “girls” in the picture are Kira and Kimba, two American Shetland ponies who have recently taken up residence in Auersthal to be spoiled and pampered by my friends FotoMarathonMan and AkhalTekeGal. 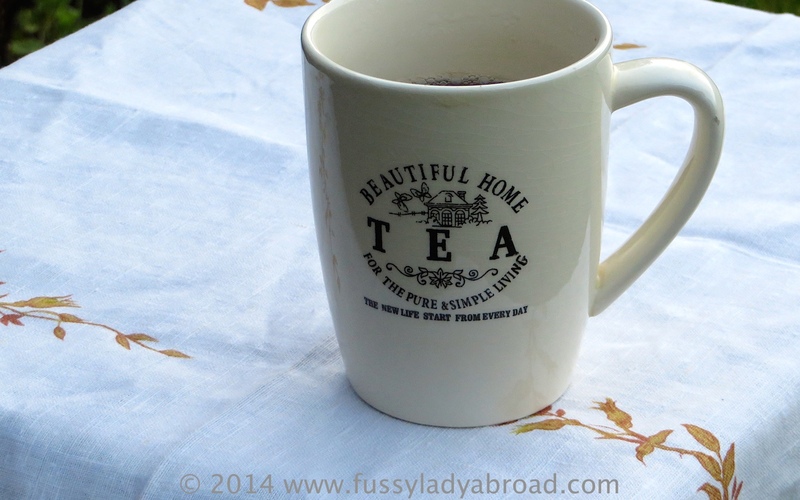 I made my way to the lower Austrian prairie to meet them and to enjoy a proper cup of tea at their residence. 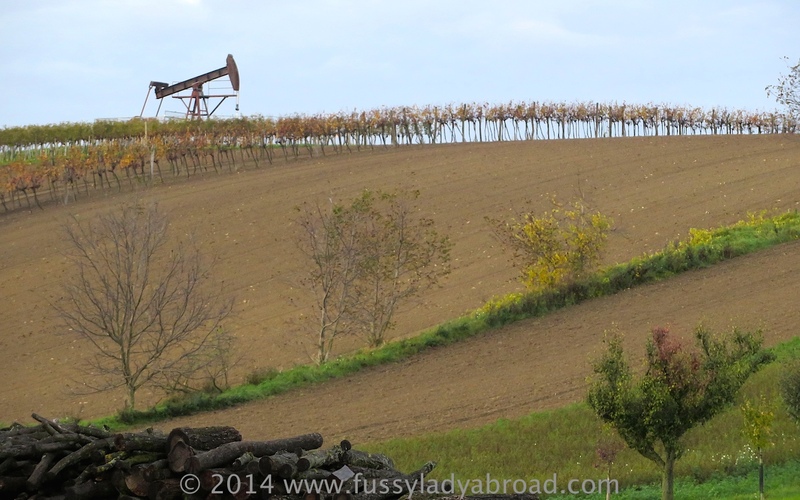 That part of Austria is where the oil fields are. Like Texas. Just a bit smaller. The water in Auersthal is hard and the water in Vienna is soft. Fortunately the good people at Taylors of Harrogate who make Yorkshire tea have considered that and offer blends for both water types. I have even seen people in Scotland buying Yorkshire Tea because even with the teabags it is possible to produce “a proper brew.” Now, you may have heard me complaining about “dust filled bags” and of course, even Yorkshire teabags are essentially dust filled, but I now claim that, as it is dust collected for the British market, it is of a superior quality and can, sometimes, when made in a pot, with water that is hot enough, produce a drinkable cup of tea. Now to the gin – Edinburgh Gin and Fever Tree tonic, quite delicious. FotoMarathonMan had also brought some gin garnishes from a recent trip to Spain. I put some cardomom seeds in mine, and AkhalTekeGal had hibiscus bloom in hers. The hibiscus made the gin turn pink after a while and it gave a rather sweet flavour. We enjoyed it, but we’d have been just as happy with the gin and tonic as it was. Fever Tree tonic is slowly becoming my favourite. 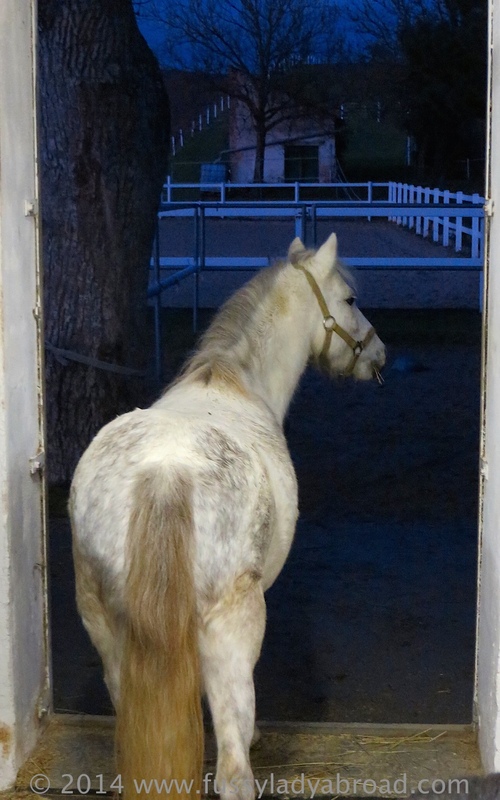 It’s not just Kira and Kimba that are pampered and spoiled, my hosts took great care to make sure that everything a fussy lady might require was on hand, and presented in some style, considering we were in a stable. The presentation of the sustenance for Kira and Kimba was slightly less sophisticated, but they seemed to enjoy their afternoon tea nonetheless. Well this stable is very well equipped with tea making facilities, but there is also everything Kira and Kimba and their flatmate, the Kinsky warm blood Kalina could need. Kalina stands a proud 17.5 hands high, and if Kira and Kimba stood on top of each other, they would just pip her at the “who’s the tallest” mark on the doorpost, for they are a dinky 10 hands each. They can all move freely between their box and the yard, and so they live in relative luxury. I wonder if they all snuggle up for girly SingalongaMammaMia evenings? This being the girls’ private residence, I was the only guest. The staff, FotoMarathonMan, AkhalTekeGal and AnnieGetYourPitchfork are kept busy attending to the needs of the three ladies who inhabit the stables. As befits the rustic location, the facilities are simple but clean and the hand drying is proper. 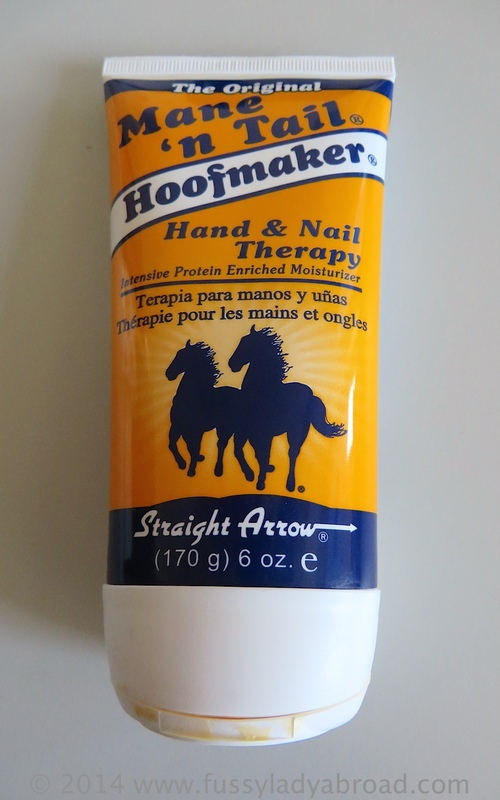 There was even hand cream but it was not which, in spite of the apt name, I would not really recommend because the tube does not close properly. Kira and Kimba do not use this facility, but instead, chose to relieve themselves at the same time, on the straw covered floor of their box. Since this is Kira and Kimba’s exclusive abode, you’d have to get an invitation from AkhalTekeGal and FotoMarathonMan to visit. In case you are one of the lucky few who may be invited, you can indeed expect a proper cup of tea and a decent gin and tonic. So, it’s 5 little teapots to the stables at Auersthal for excellent hospitality and the cutest, most charming hostesses Kira and Kimba. A work trip to Frankfurt gave me the chance to investigate where a lady of a fussy disposition might get a proper cup of tea in that city. Fortuitously close to the fair, the Hessischer Hof would be the one to try. 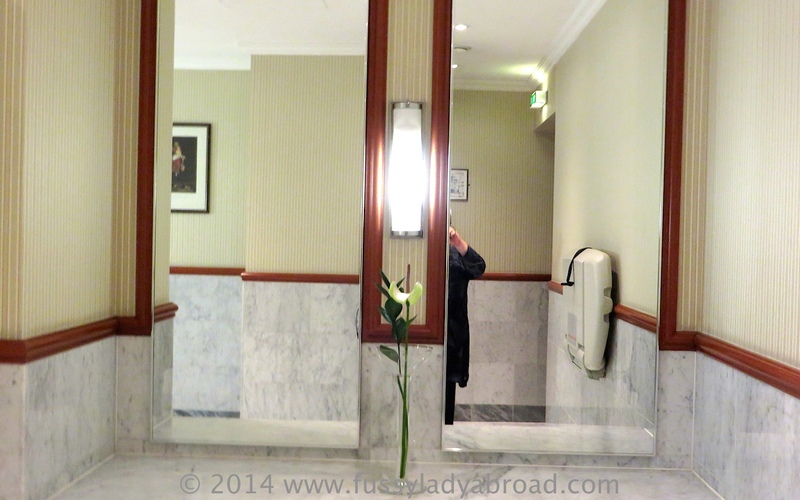 It claims to be the only 5 star hotel in Frankfurt that is still privately owned. The lobby lounge looked comfortable, but it was rather dark, and having been deprived of daylight all week, I took my seat in the conservatory which faces the main road. I selected my tea from a short list. When it arrived it was quite nicely presented and included a florentine type biscuit. I do like a silver teapot and I was glad of the little cover to safegaurd my fussy digits from the hot handle. 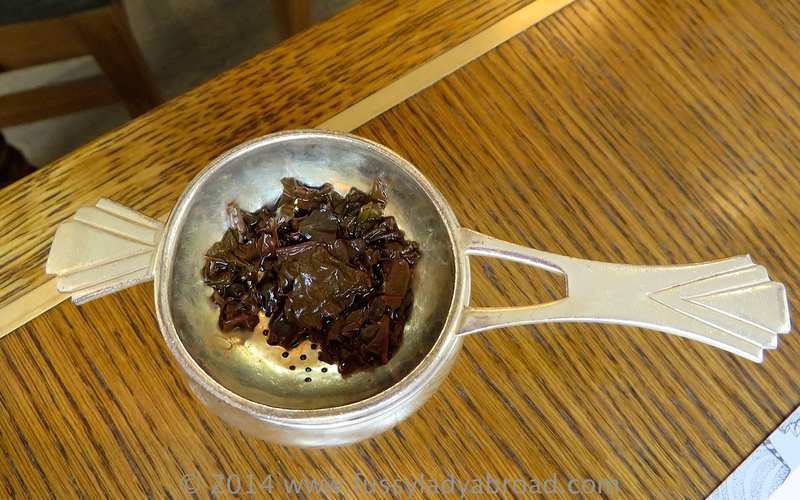 The tea was hot, made from proper tea leaves supplied by a renowned German importer and tasted fine. The welcome was warm enough and my order was competently fulfilled. The staff on duty were quite young. Mind you, these days I think everyone is young. The conservatory is a pleasant enough space. However, I was stunned, when, in the middle of it all, two porters came in and started moving and stacking the furniture. Not a word of explanation or apology was offered. They just rattled around with their tables and chairs. The sound of the heavy chairs being dragged across the tiled floor in that high space was deafening. I was perturbed. It ruined the experience. Surely, in a 5 star hotel, one should consider the comfort of guests. “Excuse me, madam, we are just about to prepare this room for an event, would you perhaps like to move to the lounge so that you are not disturbed?” is what I would like to have heard. 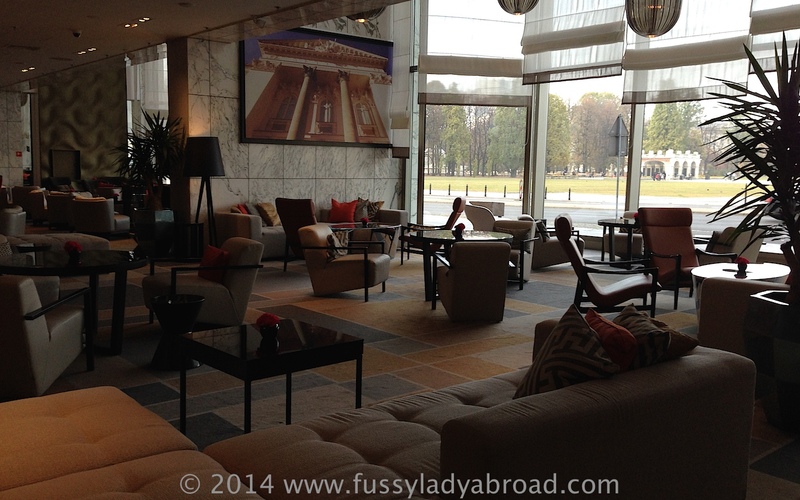 It was a very busy time in Frankfurt and the hotel was certainly full, but at that hour, other guests were few. A group of business people were negotiating and drinking tea. An English lady was having a non-alcoholic cocktail with an elderly gentleman, and that was it. 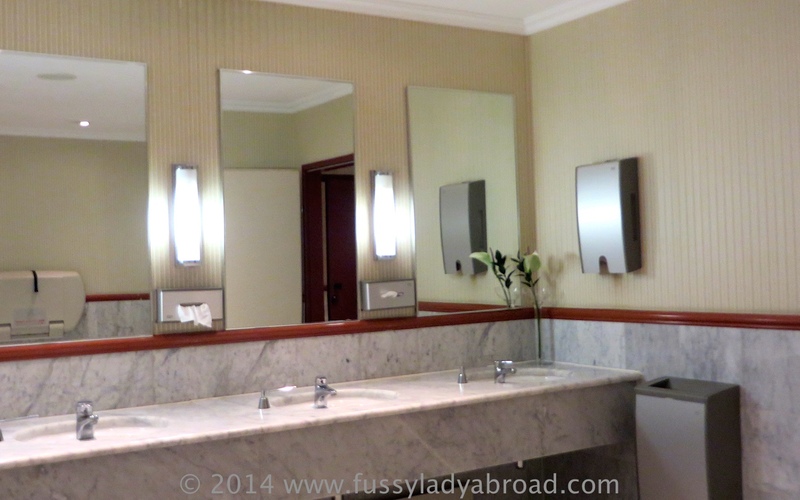 The ladies room was clean and functional, but lacking in any flair or sense of luxury. I was glad to note the proper towels. 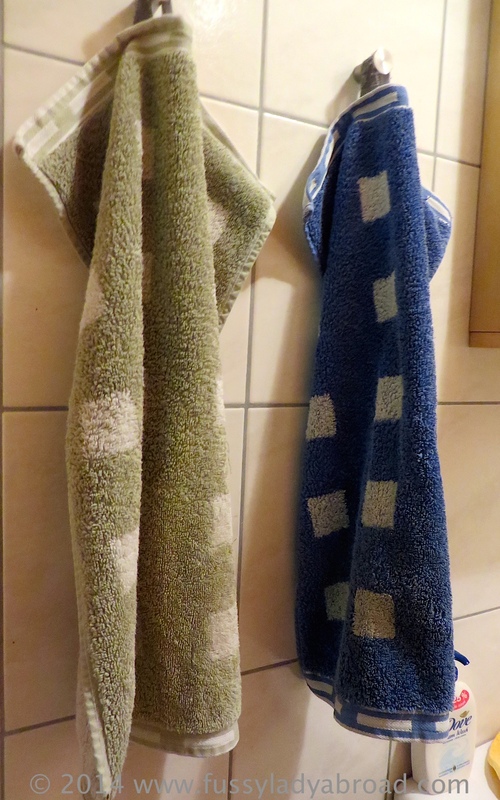 When it comes to the fast efficient drying of hands, I think the proper towel, actually facecloth option is best. It’s even better than a Dyson Blade, and I really like a Dyson Blade. I understand that costs are a factor, so I only expect the laundered facecloth in 5 star hotels and very nice restaurants. In other places I am happy with a Dyson Blade. 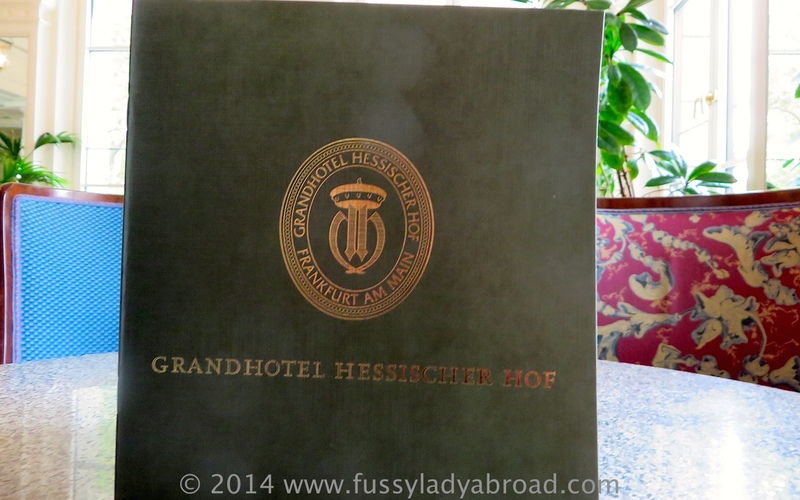 Grandhotel Hessischer Hof is surely an establishment to visit. 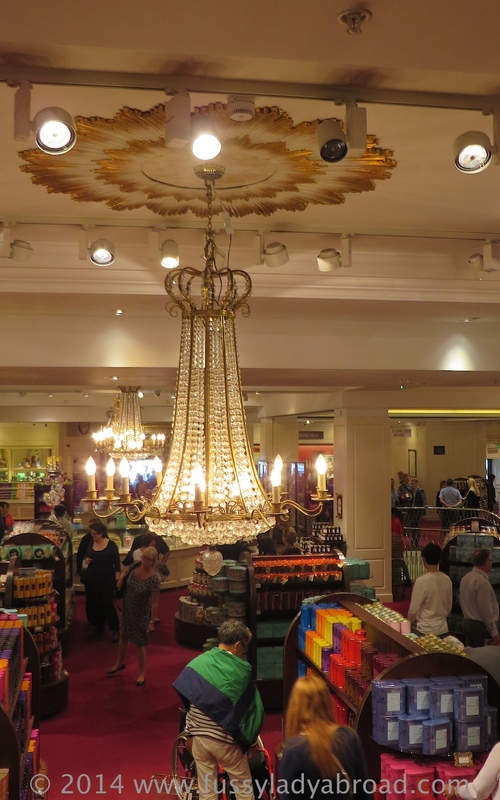 It has a certain air of old fashioned luxury even if it is a relatively new building. Just scale down your expectations and appreciate the “traditional” atmosphere. Although the tea itself might have merited 3 teapots, I’m afraid the Hessischer Hof scores only 1 teapot out of a possible 5 because of the furniture removal. A weekend in London with my friend WifieWhoLunches: we had planned a few days of drinking champagne in nice places and generally being kind to ourselves. We work so hard the rest of the time, you see. Anyway, on Sunday evening, after an early dinner, we decided to see the city from above. We had started our day at the Southbank Centre on the lovely garden terrace at the top of the yellow staircase. 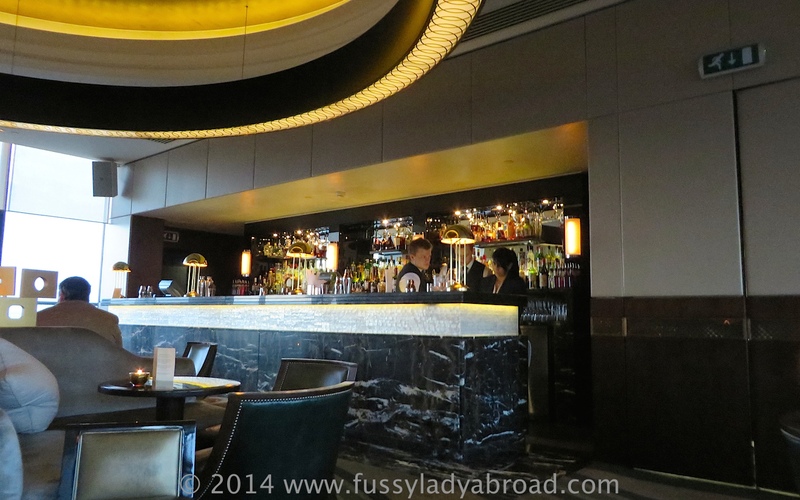 And so, having failed to book at Paramount, not wanting to queue for The Shard, and having already enjoyed great drinks and outstanding service at the Oxo Tower, off we went to the rooftop bar at the Park Lane Hilton. Tips for high places in London or elsewhere are welcome, just add them in the comments below. We were welcomed by a smart young man who took our coats and then passed us into the care of a young lady. All weekend we had enjoyed excellent service, usually given by bright young things from other parts of the European Union. Such a fabulous opportunity for these young people to improve their English, and wonderful for us to enjoy the enthusiastic service they deliver. The bar is comfortable and relaxing. It is not overly decorated, with just the 1930s style bar and lighting. All the window nooks were occupied when we arrived, but we were happy enough to sit on the leather chairs in the second row and watch the people as well as the view. The bar was not busy when we arrived. There was an exotic looking long haired young man dressed like a rock star and he was accompanied by a stick thin (heroin chic?) young lady who may have been a model, or may have been someone he just met that day, or may have been his good lady wife. Their appearance was scruffy, but obviously expensive. It looked like the lady had had more than Penicillin. In the nook opposite, a family seemed to be celebrating some anniversary and a few couples were taking a drink and enjoying the view of sunset from the 28th floor. 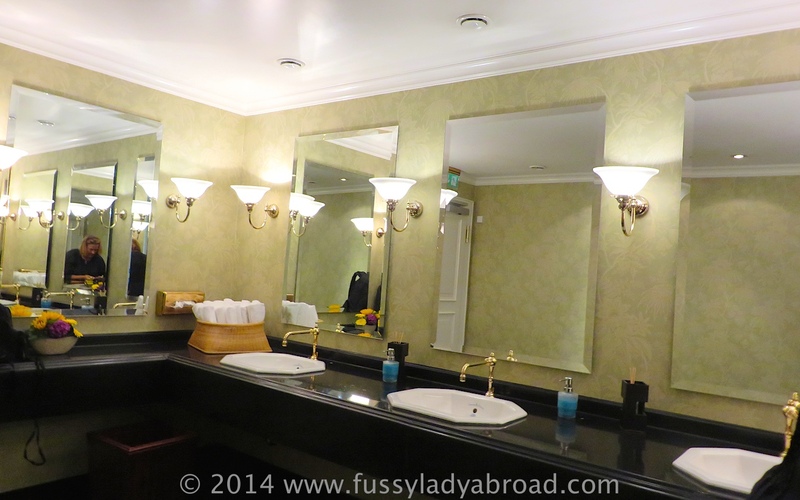 The main purpose here seems to be to offer the glamorous clientele the opportunity to touch up make up and so on, since there are lots of seats and mirrors, but only one wash hand basin. It was spotlessly clean and very comfortable. We had a lovely time at Galvin at Windows and, although we probably paid the same for those 2 cocktails as we had paid for dinner earlier, it was a great experience and we award Galvin at Windows 4.5 tumblers out of a possible 5. A sultry Tuesday afternoon in the office left us thirsty. 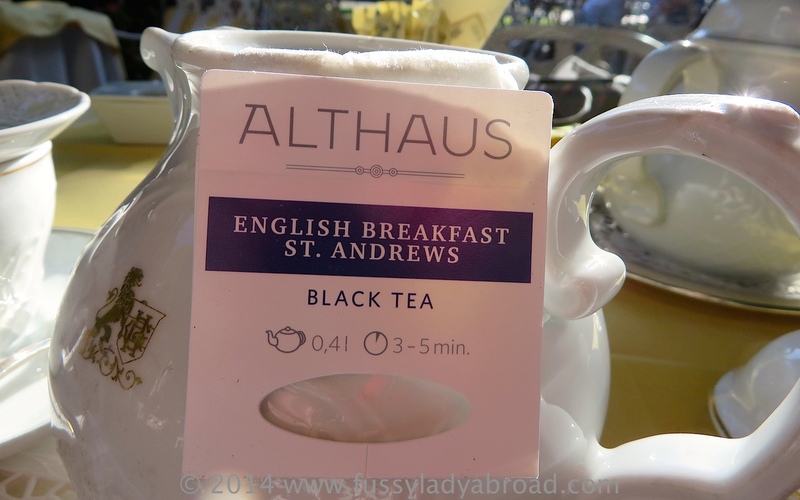 So, AustrianGinAmatrice and FussyLady headed out to Vienna’s Ringstrasse for a proper cup of tea. If we are honest, we were probably more looking forward to the gin and tonic that would inevitably follow. We chose the Grand Hotel for our tea because it is the only hotel with its terrace on the sunny side of the Ring. 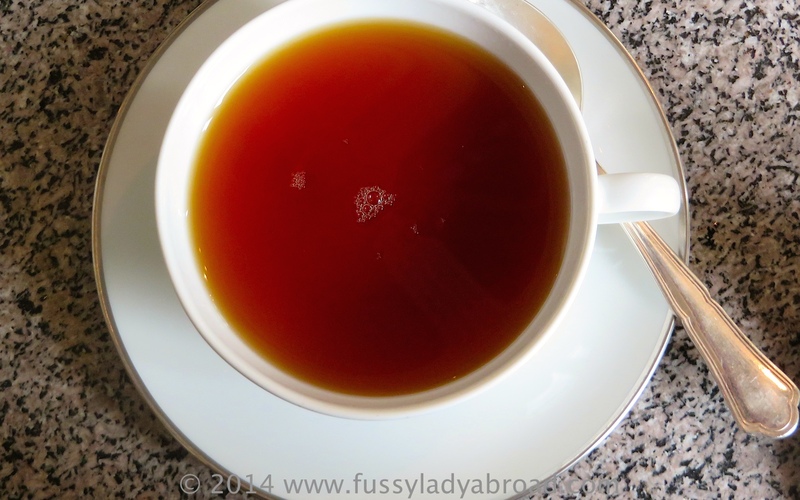 and as you can see, it is neither Darjeeling nor Earl Grey. The bag was served on the little dish, the water in the pot was not as hot as I would like. 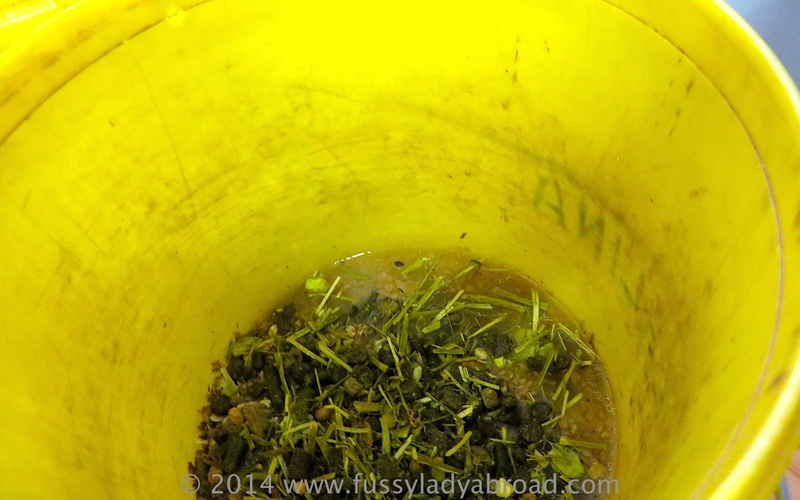 You may know by now that I have opinions about tea: the water has to hit the tea leaves. Dangling a piece of metal or a bag of leaves in lukewarm water is never going to result in a proper cup of tea. The waiters were friendly enough and checked back with us if we needed anything else. It would take more than a smile to help us overcome the disappointment of not getting what we ordered. I am sure they would have changed the tea if we had asked, but the chances of this cup of tea ever becoming memorable in a positive sense had gone. 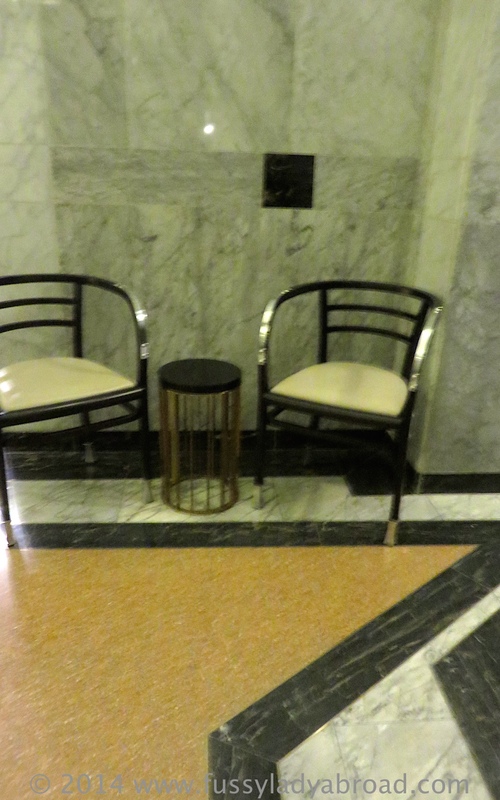 There is a grand piano in the lobby and the look is faded elegant, but the space is not really defined, so it is like sitting in a thoroughfare at the hotel reception. We chose to sit on the terrace outside. The terrace outside, being on the pavement, is like sitting on a thoroughfare. There is a further cafe upstairs on a mezzanine. It has a separate entrance from the Ringstrassengalerien shopping mall. That day, in the Grand Hotel, there was the usual mix of tourists and local and international business men. Well there had to be something Grand about this place, and this was it. 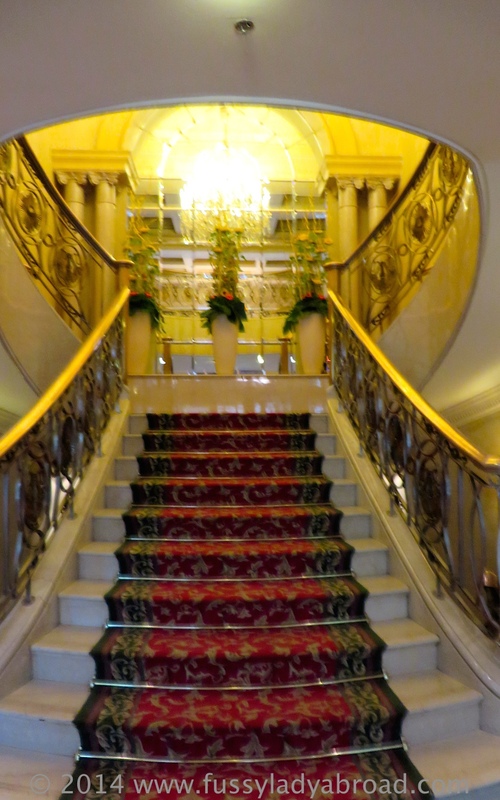 One floor down the beautiful staircase, the grand ladies room is as one would expect of the Grand Hotel Wien. Traditional furnishings and a certain gleam. The hand towels are the non woven fibre type. Everything is clean. AustrianGinAmatrice was polite about the tea, but expressed her surprise that standards could slip so far in a 5 star establishment. She clearly wasn’t prepared to take the risk of further disappointment with her gin and tonic. And so, we made our way to a newly opened restaurant on the Ring which is specialised in burgers, gin and cheesecake. We were not disappointed. Said the Butcher to the Cow will have its own review later. The Grand Hotel serves a full afternoon tea from October to April, so I shall return another time so see how it is. 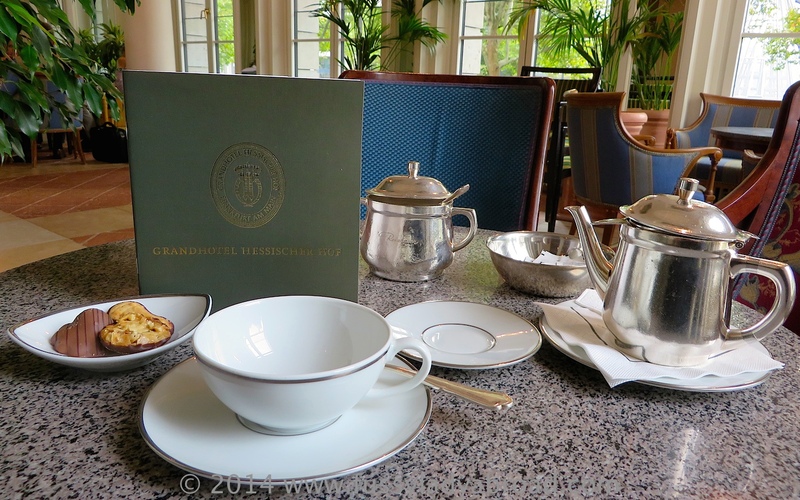 For now, and for a proper cup of tea, Grand Hotel merits 1.5 little teapots out of a possible 5. 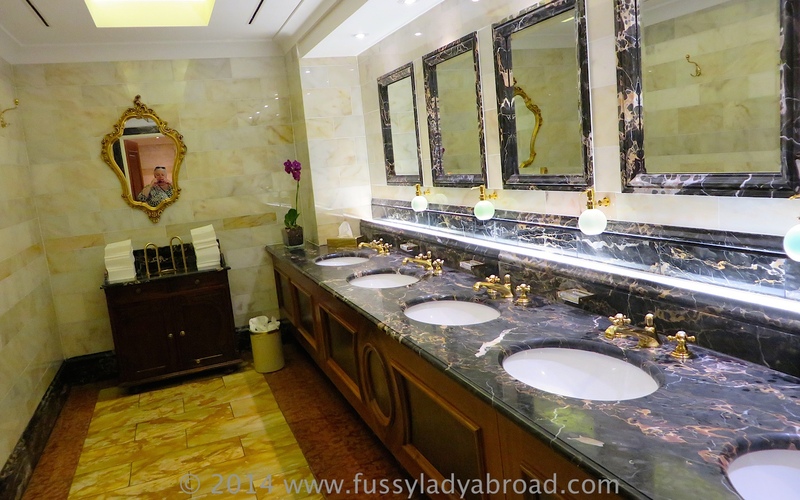 If, however, you want to freshen up somewhere grand, then the ladies’ room is worth a visit.